Infinium in all its glory. It is a celebratory tradition to open a bottle of Champagne on New Year’s Eve, usually while drunkenly slurring Auld Lang Syne. Well at least in my case. At midnight, the cork pops and it’s “Out with the old, in with the new”, as the cliché goes. But since 2010, craft beer junkies — or those who prefer suds to sparkling vino — have been able to get their hands on a “Champagne-like beer.” According to the marketing campaign anyway. This bubbly barley beverage is a collaboration between famed microbrew Sam Adams and the planet’s oldest brewery, Germany’s revered Weihenstephan. Their goal was to create not just an innovative brew, but an entirely new style of beer. Sam Adams suds guru Jim Koch claims (in many videos) that it took over two years of ambitious, tasty development to achieve this challenging objective. When it came to experimenting, other than adherence to Reinheitsgebot (the German purity law stating beer must be only made with water, barley, yeast, and hops) the gloves were off. The mashing process was tweaked as were fermentation techniques. 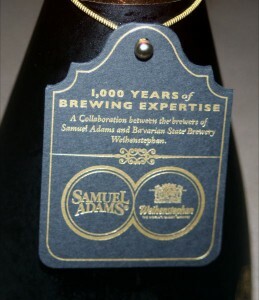 The brewing process is “patent pending” and utilizes both Sam Adams proprietary ale yeast and a Belgian strain. It’s bottle carbonated and aged using the traditional champagne-method. They call it Infinium, which sounds like it could be some new vehicle model or a infomercial vacuum cleaner, but it’s an intriguing name nonetheless. The 750ml wine bottle is absolutely gorgeous and may be worth the $20 sticker price alone. Gold decorative writing covers the bottle while red and bronze foil covers a wired Champagne-style cork. An upscale black and gold informational tag hangs around the neck, adding to the decor. An eye-catching tag provides some info. Tiny bubbles cascade up to a effervescent, white foam head on this highly-carbonated brew. It’s pale-golden in color, crystal clear, and looks every bit the part of a sparkling wine. Scents of lemon, sweet malt, citrus, and spice rise up from the flute and greet the nose. Light fruit and coriander are the first flavors noticeable, it starts out mild and easy. Bolder lemon and black pepper notes follow, with a dry tartness that lingers on to the finish. There, it’s joined by some masked alcoholic heat and subtly spicy citrus, noble hop. Soft malt flavors are found throughout and there is basically no detectable bitterness. Infinium is velvety in the mouth, with a buttery texture and quite drinkable for a 10.3% ABV beer. This special edition is smooth, delicate, and complex with tart, spicy, and fruity Belgian yeast notes abundant with each sip. Despite the high alcohol content, it’s very drinkable and light. Kudos to both breweries for coming up with something completely different. Given the inflated cost, Korbel or its kin may be a better option for those non-beer geeks but what the heck, New Years Eve only comes once a year. This is a solid and fun offering, especially on this holiday. End of the year appetizers would make a great pairing as would lighter fish. But we plan to enjoy a bottle as the ball drops while wearing silly hats. Happy New Year! Sounds awesome!!! Do you know where I can get it? Total wine maybe? Hey Jon, thanks for the comment! It can indeed be found at Total Wine, next to the seasonal brews I believe.